Yes, you too could look like this. There are numerous items of specialist gear available to the caver. 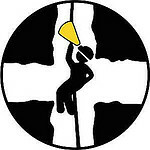 All equipment that you will need to go on a caving trip will be provided by the club in the first instance. This page is here to introduce you to the clothing and equipment you will be using during the course of your caving trip. It aims also to provide a rough guide to caving clothing and accessories available should you wish to purchase your own. Members of the caving club will be happy to provide you with their experience regarding equipment should you have any questions. Large fleece romper suit with a zip up the front (and round the crotch if that’s your scene). Makes you look like an overgrown tellytubby. Small rambling children on hillsides will point at you and shout’ Tinky-Winky!’. Ignore them. The fleece is worn as a foundation layer over underwear. It comes in a number of different styles and colours. Fleeces are light to wear and provide freedom to move around comfortably. They also provide very good insulation, ensuring warmth. This semi waterproof garment is worn over the top of the fleece. It is designed to limit heat loss, deflect water and provide protection. Again there are many different variations. On the left is the traditional Warmbac oversuit complete with neoprene cuffs and neck. Variations of this oversuit are most commonly found within the caving club. The helmet is worn, obviously, to protect your head and to provide a base from which to mount lighting. It is most handy in avoiding painful contact with the roof of passageways when bobbling through at speed. The belt is worn around the waist to support a battery pack for a lighting system, or anything else you wish to hang from it. Lace up boots and wellies are the most common kind of caving footwear. Wellies are thought to be the best footwear for caving as there are no laces to get in the way and they provide a good gripping sole. Some wellies, like the ones shown on the right, have a steel toecap whereas others do not. Again it’s a matter of preference. Obvious from the name, these are worn to protect the knees and elbows. Whilst some undersuits and oversuits have built in knee and elbow pads, extra protection is always useful in some of the more squeezy caves. Knee and elbow pads are generally worn over the oversuit. Gloves can come in many shapes and sizes, although some cavers prefer not to wear any at all. They range from household washing up gloves to PVC coated gloves to neoprene wet suit gloves. Gloves help to keep hands warm whilst protecting against cuts and abrasions. Generally cavers just wear gloves that they find comfortable but do not restrict movement or activity, such as climbing, within a cave. This is what you sit when going up and down when SRT-ing or being lifelined. A badly adjusted harness can apply lots of pressure to the young gentleman in places that really ought not to be subject to such forces. As the name suggests, these are worn as socks and help to prevent water from seeping into your outfit. They can be 2 part or 5 part, 5 part wet socks tend to be more flexible which lends to a longer life. The wet socks shown here are short which means they come up to ankle height. Much anguish is involved in the removal of wetsocks. Get a grown up to help. A fuller explanation and guide to the various bits and bobs used in Single Rope Technique is available in our Useful SRT Guide.